Sam Sikes is one of the most creative teamwork trainers I know. He has an amazing gift for finding everyday items and turning them into powerful teambuilding games props and so this is what I'll be talking with Sam about in this interview. Sam has worked with small, medium, large and extra large groups in the US and beyond. 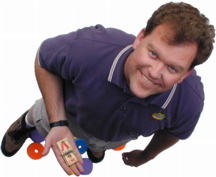 He is a prolific writer of team building games books (I own them all), and a master team facilitator. He has been awarded both the “Practitioner of the Year Award” and the “Karl Rohnke Creativity Award” by the Association of Experiential Education. In addition to all of this, Sam is flat out one of the nicest people you’d ever want to meet. What is a team building “prop”? What makes a good prop and what makes a bad one?